Amanda Hunter studied Fine Arts at Fanshawe College in London Ontario, majoring in Sculpture. Amanda then went on to complete a Bachelors of Fine Arts in Halifax, at The Nova Scotia College of Art and Design University. At NSCAD she explored sculpture through welding, wood, and clay. 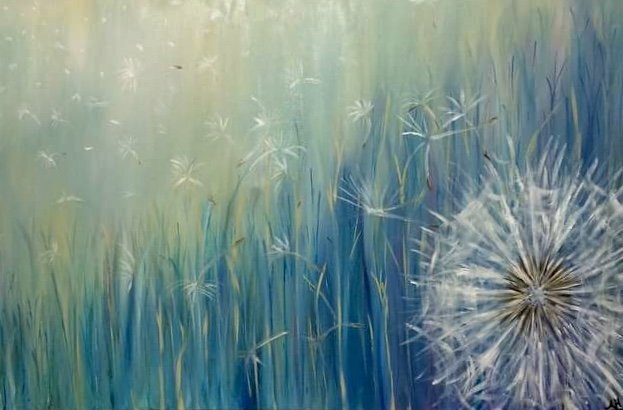 After spending two years east, she moved back to her hometown of Orangeville where she taught herself how to paint using the nature around her and her love of colour as inspiration. Her background in thick sculptures comes through in her brushwork. Amanda is an educator in Upper Grand District School Board and resides in Orangeville with her husband and three young children. Amanda is also a member of the OAG board.